Interferon, particularly for us with blood cancer, is a well-established therapeutic option. With the exception of very few eminent hold-outs, interferon is universally accepted for use in early stage MPNs. But not so long ago, the very existence of interferon was in doubt. In 1956, scientists knew that viruses — even viruses killed with heat — could produce resistance to viral infection in a cell. It was the finding at the heart of every vaccination. What we didn’t know was why. Unraveling the answer would eventually uncover unimagined powers within the human cell. It would be a long and tortured path that would end in tragedy for the chief actor. The year is 1881, the March day is sunny with snow still hard-packed on the streets of Moscow. As the popular Russian Czar, Alexander II, rides by in his carriage, an explosion from a tossed terrorist bomb kills a Cossack guard and wounds bystanders. Unhurt, thanks to bullet proof armor — a gift from Napolean III — Alexander II emerges from his carriage to survey the damage. Another bomb explodes at his feet and within hours he is dead. A witness to the carnage is the Czar’s son, Alexander III, whose first official act is to tear up the reforms drafted by his father. In the ensuing unsettled times, anti-Semitic groups spread the rumor that Jews were behind the assassination, triggering a series of brutal pogroms that would start in Ukraine and rip through the Russian Empire like a wild grass fire across the steppes. The violence culminated in the May Laws, with many restrictions against Jews, including severe limitations on education, work and residency. In the small Lithuanian town of Siva, near the Western borders of the Russian Empire, an impoverished Jewish peasant, Barnet Galinsky, survives by buying and selling small items. The May Laws condemn him to starvation. As the violence in neighboring villages increases, Galinsky flees to England. Unable to speak English, he tells immigration officials he is Barnet the son of Isaac. His papers are stamped and it is as Barnet Isaacs that he begins life in Leeds as a tailor’s assistant, eventually marrying and moving to Glasgow, continuing his trade as a peddler of cheap goods. His son, Louis, brings this trade to a thriving business in Scotland. 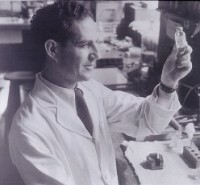 His grandson Alick Isaacs discovers interferon in 1957. The very same interferon we now rely on to hold our MPN at bay, reduce symptoms, induce hematologic remission and affect molecular response is a production version of the interferon Isaacs discovered we make in our own cells. This low molecular weight protein, a product of gene expression in the nucleus of our cells, is a formidable ally. Interferon is the foot soldier of our immune system, the “interfering particle” recruited by the appearance of an enemy pathogen. Interferon is a protein capable of incapacitating an enemy virus as well as warning neighboring cells to arm themselves against infection, commanding a Masada-like mass suicide of cells or calling in a predator strike from more powerful, special forces in the immune system. And yet, little more than a half century ago this small powerhouse was thought not to exist as an entity at all. The interfering effect was simply a process, something that happened when a virus left a bit of its shell behind. In reality it would turn out to be something produced in the heart of the cell nucleus and pumped out into the cellular war zone of infection armed to the teeth with weapons and communications gear. Using stone age techniques, crude even by the standards of that pre-digital world, Alick Isaacs along with his associates, Jean Lindenmann, a Swiss virologist and UK chemist and Yale post-doc D.C. Burke — and, early on., electron microscopist specialist Robin Valentine — worked in the Flu Vaccine section of the National Institute for Medical Research in London. In the summer of 1956, Isaacs and Lindenmann knew that influenza virus particles inactivated by heat and attached to red blood cells would interfere with live influenza cells attacking chick embryos. Here was Alicks Isaac’s critical question: If one side of a flu virus particle is attached to the red blood cell only the opposite side could interfere infecting the host cell. What was the process? Did the inactivated virus particle transfer material to the host cell…or was interference generated within the cell? 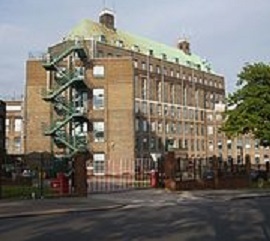 In a time of limited grasp of molecular pathways, the decidedly low tech lab of Dr. Alick Isaacs, room 215 of the National Institute of Medical Research in the Mill Hill section of London was the scene of a Keystone Kops search for an interfering particle that might not even exist. Along with his associate, Isaacs’ injected fertile hen’s eggs with killed virus and deconstructed the result — weighing, heating, sloshing around beakers with ether, freezing, diluting, concentrating in search for a particle that might account for the interfering reaction flakes of virus would create in a cell. It was how science was basically done in this largely pre-digital world where the double helix was just theorized, genetic sequencing was still two decades in the future and computers were giant machines with tape decks and vacuum tubes. Most scientists — including Isaacs and Lindenmann — believed some portion of the virus lodged in the outer walls of the cell tissue created this immunity or interference. Others believed a prior virus simply interrupted the reproduction process within the cell or consumed the available biological material. Isaacs began to believe interference came from the within the cell itself, from a particle — called interferon by Lindenmann — produced in the nucleus of the cell. The classic experiment to prove the interfering substance was produced with the host cell to repel viral attack was deceptively simple. It’s a recipe one could almost follow in one’s own kitchen if a supply of Intron-A or Pegasys is urgently needed and a handy virus, both live and inactivated, available. A drum washer, could be turned by hand. A small supply of inactive influenza virus. A small supply of active influenza virus. 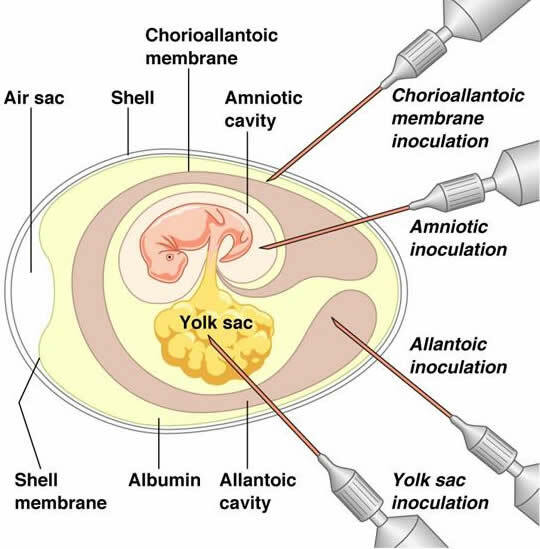 Remove the chorioallantoic membrane from the the egg. This membrane – very similar to the human placenta – separates the fetal chick’s inner environment from the outer world. It’s inner and outer structure make it ideal to separate effects from outside the cell from responses within the cell. Cut it into several convenient sized pieces. Place heat-inactivated influenza virus in Tumbler #1 filled with a salt water bath. Place in fresh fluid in Tumbler #2. Remove after several hours and place in a bath in Tumbler #3. Introduce live influenza virus to see if membranes exhibit “interference” or resistance to viral infection. Now for the punch line. The action that made this experiment a classic in the history of biology. Place a fresh set of membranes in Tumbler #2 and introduce live influenza virus. If these membranes – which had never been in direct contact with virus, showed signs of interference the case could be made for cellular production of “some inhibitory substance.” That is, something inside the cell itself was resisting infection. Significant interference was registered. Because the methodology was so crude and the possibility of error great, this elegant, simple proof at first was greeted with scorn in scientific circles. Some American virologists ridiculed the findings published in The British Journal of Pathology –calling interferon the “misinterpreton. ” After publication of a second paper and sharing the results of what might be a “penicillin for viruses” at professional meetings, Isaacs himself began to have doubts, wondering if some residue of virus might have contaminated the experiment. He grew depressed, suffered a “nervous breakdown” and was briefly institutionalized. This period of doubt was followed, shortly afterward, with extravagant hopes worldwide and claims for the new silver bullet as the Isaacs-Lindenmann experiment was replicated. 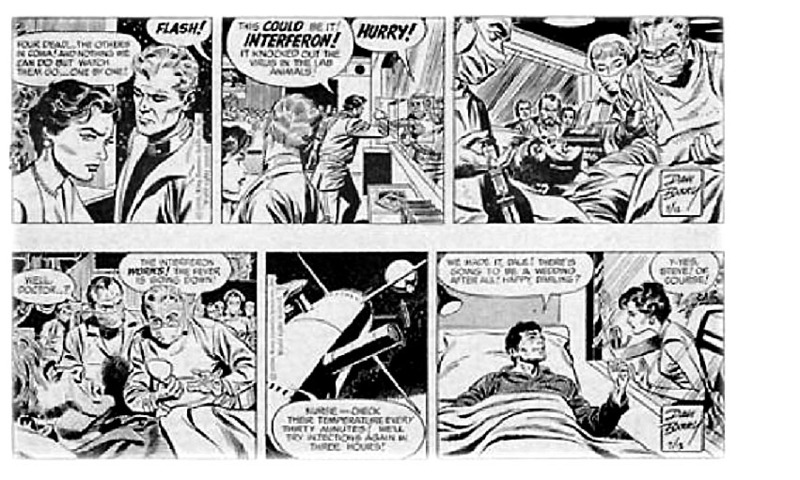 Many considered it the penicillin for viruses and hopes for its miraculous future were expressed in popular media like the Flash Gordon comic strip. Once its existence was established, purifying interferon and ramping up production was no easy matter in the pre-digital age and would take years, patent battles, and huge investment to finally succeed. Isaacs suffered a subarachnoid hemorrhage that that hampered his productivity but didn’t prevent him from continuing his work as director of the World Influenza Center and contributing ideas and encouragement to the scientific team at Mills Hill. He was elected to the Royal Society of Fellows in 1965. A second hemorrhage ended his life a year later. He was 45 years old. Alick Isaacs would not live to see his discovery become the wonder drug saving millions of human lives and offering blood cancer patients hope for remission and survival. The work of a young doctor, an associate professor at Cornell Medical School, would soon help bring that day forward for MPN patients. There are close parallels between the lives of Alick Isaacs and Richard Silver. 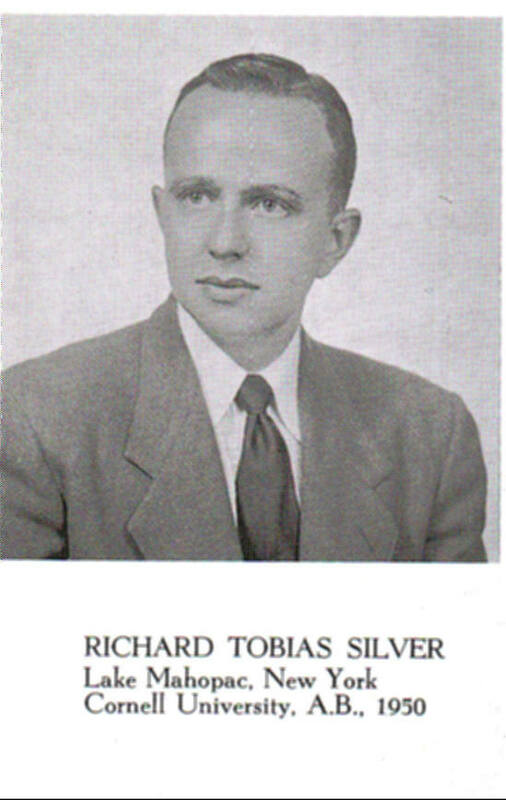 Like Isaacs, Silver’s father, was driven from his home in Russia by anti-Semitic riots. As a child of nine, the youngest of a large family, he arrived at Ellis Island in 1909 without speaking a word of English. 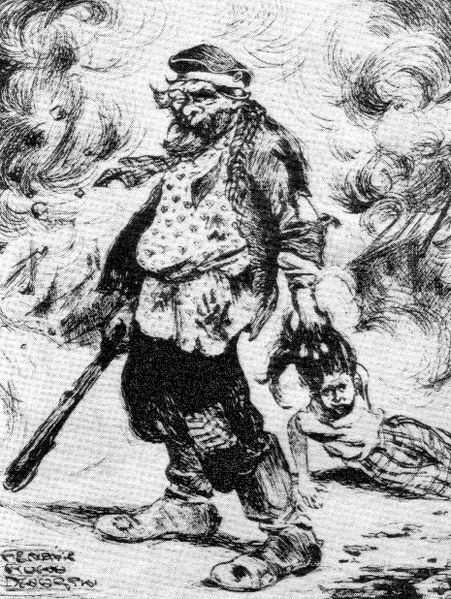 In Russia, following the revolution of 1905, widespread unrest and violent anti-Semitism led to pogroms in Kiev, along with Bialystock, Odessa, and Kishniev. Instead of settling in a working class district of Glasgow, like the Isaacs, the Silver family, including nine year old Benjamin, got started in the New World ghetto of New York’s Lower East Side, on Eldridge Street. Benjamin Silver worked his way through Brooklyn Polytechnic earning his civil engineering degree and started work on the New York City subway system. Both there and as an engineer working on the George Washington Bridge he ran across the same anti-Semitism that drove the family out of Russia. He quit and became a successful independent contractor building apartment houses. started to follow his father into engineering but was curious about medicine, a career his older brother Norman had embraced. 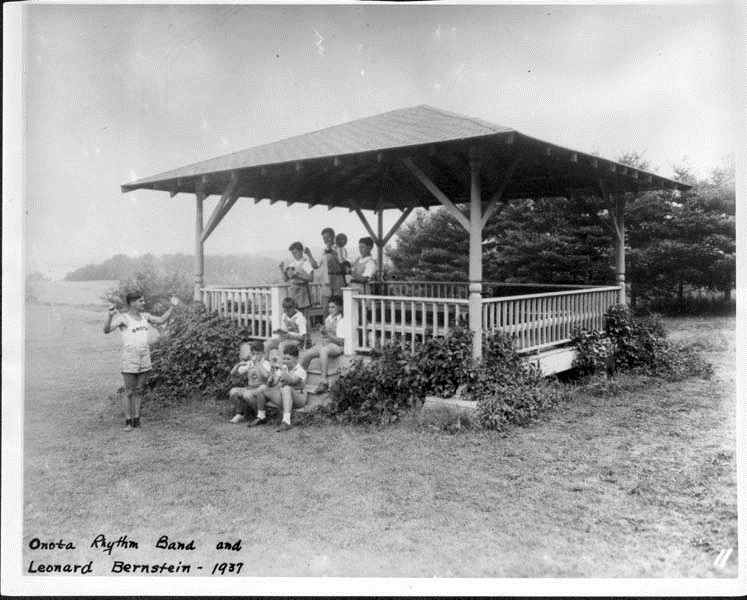 On a lark, Richard applied to Cornell Medical School in his junior year and was accepted, thus merging his path into the history of interferon, a channel Alicks Isaacs would soon open in London. Just two years before Isaac’ famous experiment with Lindenmann proving the existence of interferon, the newly minted physician Richard Silver was swept up into the Korean War draft. He couldn’t get into the service because all the slots for doctors were taken in 1954. The draft age residents at Cornell, however, were ordered to go into the service. “So I went down to Washington to make the rounds,” said Silver, “and visited the Air Force which did have openings for a flight surgeon. You have to jump out of an airplane. That sounds like fun, I said. I was 26…why not?” The problem seemed solved up to the physical that he failed due to nearsightedness. Since it was essential for him to participate in the draft to continue his appointment as a resident at Cornell, he asked his Chairman of the Department of Medicine for an available alternative. Which is where fate took a hand in shaping his future. Working in research as a member of the Commissioned Corps of the U.S. Public Health Service at NIH was one alternative and Silver opted for the Heart Institute.“Out of the question,” said the Chief. “The only opening is in the Cancer Institute.” To Silver, cancer was the “gulag of medicine where terrible things happened and people died.” Reluctantly, with little choice, he started work at NIH. He little dreamed his work there would soon lead him to a commanding role in research and clinical practice in both hematology and oncology and help bring Isaacs’ interferon into the mainstream of MPN therapy. Dr. Richard Silver was the pioneer in IFN-research in PV in the U.S., publishing the first report in 1988. Since then he has contributed significantly with several classical papers on interferon in MPNs. Recently Dr. Silver and his colleagues from Weill College have also shown that even patients with hypercellular myelofibrosis may benefit substantially from this treatment. We claim Dr. Richard Silver for our own, considering him the dean of MPN hematology, ignoring the major thrust of his work in his specialization, clinical oncology. He has done important work in Hodgkins disease, chronic myeloid leukemia with Brian Druker and breast cancer… apart from the myeloproliferative neoplasms with which he is most closely associated. 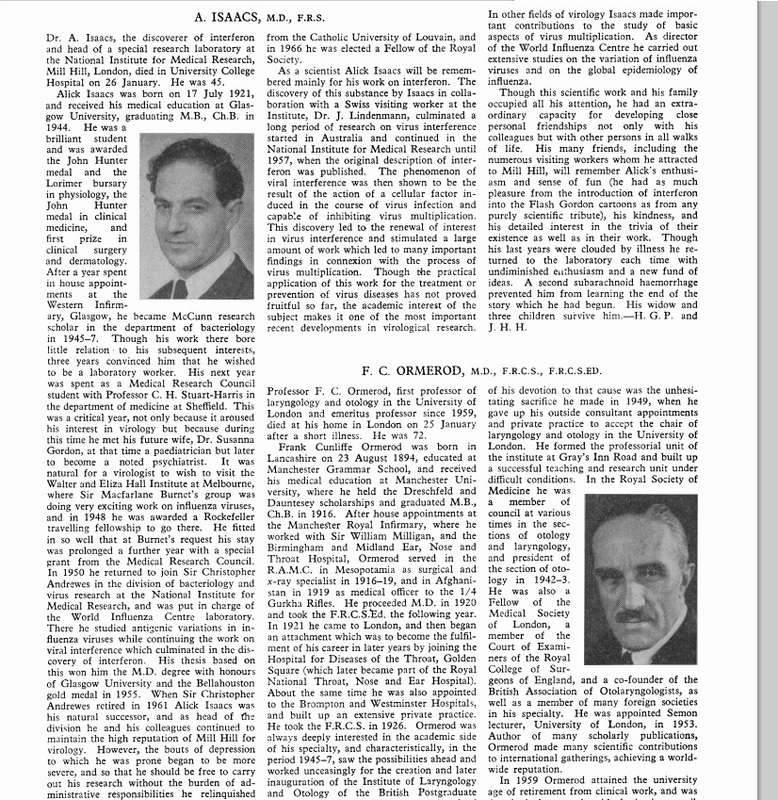 Silver’s letter to the editor in Lancet (1988) on recombinant interferon alpha for PV preceded by a year his seminal monograph (with Dr. Harriet Gilbert) on Intron A (interferon alfa-2b recombinant) in the management of myeloproliferative disorders. Together these publications mark the beginning of interferon’s rise to prominence in MPN therapy. These works were published at a time interferon was largely used as an anti-viral and anti-bacterial medication and in anti-tumor therapies with applications in various cancers. 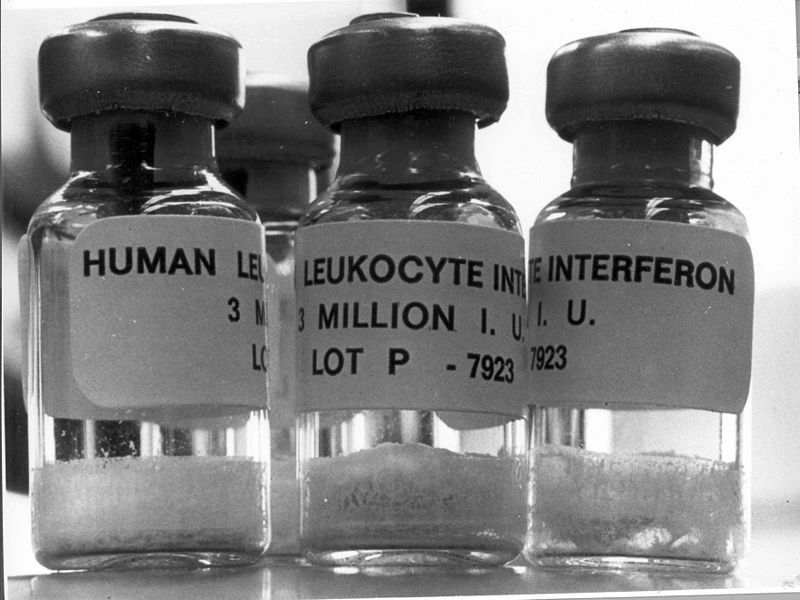 Recombinant interferon — the end stage of cloning human interferon and genetically fusing it with another, fast growing organism like yeast or bacteria — first became available after 1980, and Silver’s work in applying these substances to relieve MPN symptoms opened the door to a flood of combinatorial research and clinical trials going on to this day. Silver’s role in bringing interferon to MPN therapy cannot be over-stated. He has been relentless in clinical investigation, research and publishing. Although his earlier focus had been mostly the acute leukemias, he turned his attention back to the MPNs describing long-term interferon treatment options for polycythemia vera in Seminars in Hematology (1997). 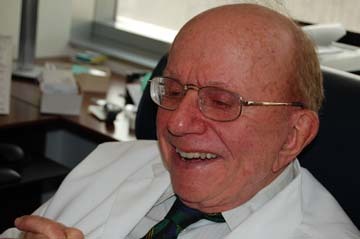 As a member of both the Polycythemia Vera Study Group and the International Working Group for Myelofibrosis Research and Treatment he researched, wrote, spoke and published on interferon throughout the past two decades in a prolific and intense campaign to gain acceptance of interferon as a front-line therapy. 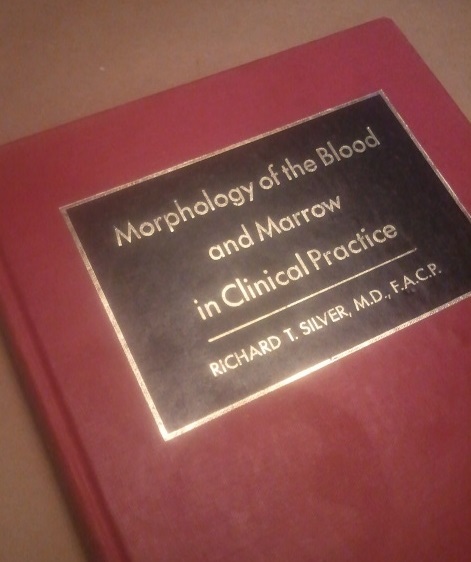 In 1999, Silver was also Chairman of the Guidelines Committee of the American Society of Hematology comparing interferon therapy –which was standard for the treatment of CML– to marrow transplantation and hydroxyurea and busulfan. In 2009 he published two milestone papers, a Letter to the Editor of Leukemia describing how recombinant interferon alpha could retard progression of early primary myelofibrosis. In this letter he presented results of research demonstrating interferon’s ability to improve bone-marrow fibrosis and control splenomegaly and reduce production of megakaryocytes as well as inhibit thrombopoietin signaling — all components of MF. This at a time there was thought to be no drug available for relief of MF. These studies, along with the The Expert Reviews article written by Silver, Kiladjian and Hasselbalch, published last month (Part III, below), are the Interferon Papers, the summing of contemporary understanding of the interferons in treatment of MPNs. There is no last word in scientific research. But with the appearance of this comprehensive review of the interferons in MPN clinical practice the trajectory from the Room 216 in the Isaacs-Lindenmann lab through Silver’s Weill-Cornell offices in the towers New York City to hematology clinics and examination rooms worldwide has been completed. (Silver on newly opened trial of Intron and early MF: Contact: Ruth Baumann, R.N. The final word on interferon and MPN treatment comes from the three men who share the deepest clinical experience in applying a molecule derived from the cell’s own defenses to roll back the effects of myeloproliferative neoplasms. The thrust of the opening abstract is direct: Interferon works. The scientific paper itself, “Interferon and the treatment of polycythemia vera, essential thrombocythemia and myelofibrosis,” (Expert-Reviews – Hematology [2013) by Richard Silver (Weill-Cornell), Jean-Jacques Kiladjian( Hopital Saint-Louis, Centre d’Investigations Cliniques, Paris) and Hans Carl Hasselbalch (Roskilde Hospital, University of Copenhagen, Denmark) is a comprehensive summary of interferon treatment in MPN and includes specific dosing recommendations and detailed notes to source material for the curious and skeptical. 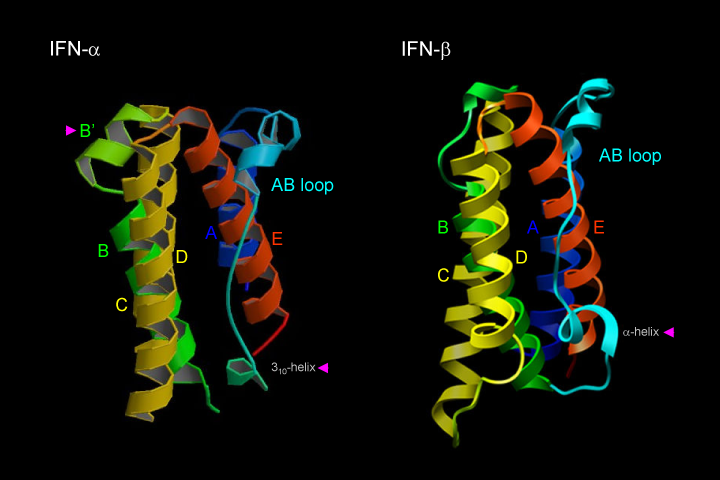 Opening with a description of the interferons , the authors describe the various forms of Type I interferon — recombinant IFN (Intron) the dominant IFN until the advent of pegylated IFNs which are universally used in Europe. They compare the two types of pegylated recombinant IFN — PegIntron and Pegasys and conclude Pegasys “…once weekly, compared with [Peg Intron] once daily, results in fewer side effects, higher rates of hematologic and cytogenetic response and greater overall survival in patients with CML. ” (Data is not yet available for comparisons in MPNs). The value of this paper for the patient and the health care provider, beyond summarizing applicable MPN interferon research, is in its coverage of specific MPNs and their treatment. After taking issue with the World Health Organization’s classification of PV based on hemoglobin levels versus red blood cell count, the authors make a case for the importance of correct diagnosis in PV treatment. Their retrospective summary of 25 years of research covers about 400 patients in nearly 20 trials using IFN. Here’s the result: “Complete hematologic response is usually observed within one year but sometimes phlebotomies are required for up to two years depending on the dose and severity of illness. Reduction of phlebotomy rates have ranged from 47 to 100% in 12 of 17 trials. Mostly for convenience, the authors prefer Pegasys once-a-week dosing, 45µg x 1 subcutaneously or PegIntron at 30 µg once a week. They note a significant decrease in megakaryocyte number with use of pegylated recombinant interferon. And attribute “remarkable thrombosis-free survival rates to both the cytoreductive effect of interferon and their maintenance of 40-55% patient hematocrit levels. The authors believe the optimal target hematocrit should be 45% in men and 42% in women. They recommend sequential bone marrow biopsies, once at diagnosis and every third to fifth year thereafter…unless there are changes in developing disease. Phlebotomy only treatment is a clinical misconception according to the authors citing misreading of study data and the dangers of chronic iron deficiency resulting from repeated phlebotomies. The severest criticism is leveled at all alkylating agents and HU owing to their leukemogenic potential. Admitting there is no strong clinical trial data proving HU is leukemogenic they point out, reasonably, that only long-term follow-up beyond 10 years can accurately gauge the risk. There was a long-term trial of another drug (pipobroman) in which there was an HU arm. The leukemic incidents in the HU arm was16.5% after 15 years and 24.2% after 20 years. There is no evidence that IFN is leukemogenic. A major finding is the decrease in JAK2 allele burden in 70% of patients treated with Pegasys. The JAK2 mutation became undetectable in 24% of patients in one series. There are reports much higher rates of sustained and maintained response in 10 of 35 patients . There are high risk ET patients: Those over 60, those with platelet counts over 1.5 million, and those with a history of thrombosis. Those without any of those factors are low risk and there’s an intermediate group that fits between those two. The authors find Pegasys to be effective in a young group (median age: 37 years) of 59 high risk ET patients with 76% achieving complete hematologic response. Based on the risk of conversion to MF, the authors believe an argument can be made for early treatment of ET with IFN even in low risk groups. In ET Pegasys or PegIntron can be started at 45 and 30 micrograms /week and recombinant interferon alpha 2b (rIFN-α-2b) used at a starting dose of 500,000-1,000,000µg three times weekly, adjusting dosage based on need and toxicity. Interferon in any form is not an effective therapy in late-stage myelofibrosis characterized by substantial collagen fibrosis and osteosclerosis. For this reason the authors favor intervention in early stage of MF. They report on a small study of 17 patients meeting WHO diagnostic criteria for low or intermediate MF. “Of the 17 patients treated, 14 showed complete remission. Of the 15 patients with splenomegaly, nine had complete resolution. The results are promising but need to be confirmed by large-scale, long-term study. Although interferon naturally occurs in the human cell and recombinant production versions are not cytotoxic, doses of therapeutic IFNare orders of magnitude higher than that naturally produced in response the presence of antigens. Approximately 10-20% of patients suffer adverse reactions from IFN therapy. As Richard Silver has pointed out elsewhere, most ill effects appear to be dose related. (Initial MPN dosing schedules were based on treatment of CML.) In any event, certain conditions preclude treatment with interferon: depression, central nervous system disease, peripheral neuropathy, thyroid dysfunction, autoimmune disease and certain significant abnormalities of the heart, kidneys, and liver. Concluding, the authors “believe that rIFN should be the initial treatment in patients with de novo PV, especially in PV with myelofibrosis and rIFN should be considered a first-line treatment in patients with ET. Both because of favorable clinical, hematologic, morphologic and molecular response and the durability of effect permitting discontinuation of treatment the authors believe recombinant interferon may be the drug of choice of the MPNs. The bottom line: Early treatment of MPNs with low-dose pegylated recombinant interferon may result in improved disease free longevity. © Zhenya Senyak and MPNforum.com, 2013. Unauthorized use and/or duplication of this material without express and written permission from this blog’s author and/or owner is strictly prohibited. Excerpts and links may be used, provided that full and clear credit is given to Zhenya Senyak and MPNforum.com with appropriate and specific direction to the original content. A exciting and fascinating story on the lives of the people who discovered the interferons in the 1950s, a relatively primative era of medical science by todays standards. An equally interesting account of how Dr Richard Silver came to work in the field of MPNs and to promote the use of interferon to the benefit of MPN patients around the world. Great story Zhen!